Global adoption of the cloud is accelerating at a dizzying rate each year with businesses of all sizes realizing the cost-saving, flexibility, and scalability benefits of migrating and running applications in the cloud. In a 2016 survey*, F5 found that 67 percent of the respondents identified themselves as “Cloud First,” and three cloud models—private, public, and SaaS—dominated the top five IT strategic trends. As pressure to move applications to cloud and hybrid environments intensifies, IT teams must grapple with sometimes significant migration challenges. Though each migration is different, there are several common considerations to keep in mind to help you on your own cloud journey. 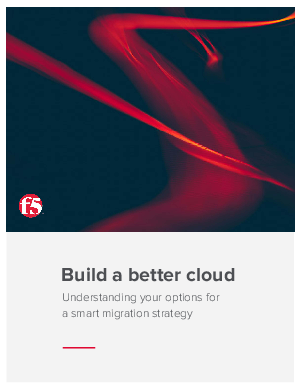 This guide provides a blueprint to help you think through many of the long-term impacts of your migration options and establish a strong foundation for your cloud migration strategy. The end result should be a migration strategy that leaves you in a position to support your technology as your business scales.